« Really Good Day Today! I must say, today does feel warm. I think it is the humidity that makes it feel so warm. Temperatures in the upper 80s and sunny with very little wind. More of the same through nest week with temperatures in the low 90s. Saturday and no generation. Think I mentioned in yesterday’s report that they are supposed to turn on one unit for one hour around 3:00 p.m….that should be 5:00 p.m. Sunday looks like 4:00 p.m. As I said, we’ll see. Stan on the water Thursday with one of his regulars, Mike from Oklahoma. Good day for Mike. No generation when they started the trip, but two units came on at noon. Big ruby and the black coper head zebra were their flies for the trip. This was a case of the one that got away. Mike had at least a 20 incher almost to the boat and it broke off. Good story!!! 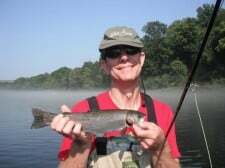 Friday, Dana had a couple of fairly new fly fishers on the water, Gary and Donna, from Raymore. They caught fish on the CQ streamer, the tan b-bug and the black copperhead midge. Carolyn had Ron and his son, Brian out again. These guys from the Kansas City area had a great day on the water with the black copperhead midge while the fog was on the water. Once the fog lifted, it was the P&P dropped from the copper dun. Just before we came off, two horns went off, so it was rig up for the rise. We had about 20-30 minutes of fast and furious hooking, rolling and bringing in rainbows on the big ruby with the red San Juan dropper. Doc and Terry from Oklahoma, spent the day on the water with Stan. Really good day for these guys too on the black copperhead midge. This entry was posted on Saturday, August 24th, 2013 at 12:43 pm	and is filed under Fishing Reports. You can follow any responses to this entry through the RSS 2.0 feed. You can leave a response, or trackback from your own site.